WE HAVE SPENT the day monitoring some of the key constituencies across the country. Update 1.10am: There are now four left battling it out for three seats – Labour’s Kathleen Lynch, Fianna Fáil’s Billy Kelleher, and Fine Gael’s Pat Burton and Dara Murphy. Update 12am: Jonathan O’Brien has been elected for Sinn Féin on the eighth count. Update 8.45pm: The Labour party are said to be conceding that they will not win a second seat in the constituency. Update 7.20pm: No one has reached the quota on the first count with Sinn Féin’s Jonathan O’Brien currently heading the poll and looking certain to take a seat. 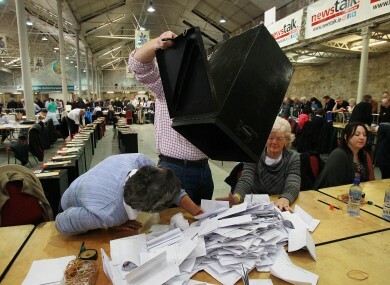 Update 6.35pm: Deirdre O’Shaughnessy from the Cork Independent tells us that the first counts are due shortly. Labour’s Kathleen Lynch is going to be elected. Second will be Sinn Fein’s Jonathan O’Brien and then Fine Gael’s Pat Burton. The fourth seat is a fight between Fine Gael’s Dara Murphy, Labour’s John Gilroy and Fianna Fáíl’s Billy Kelleher who may not get enough transfers to be elected. Update 2pm: Jonathan O’Brien looks set to win Sinn Féin’s first seat in the constituency while Kathleen Lynch should hold her seat for Labour. Fine Gael will have one of its two candidates elected with Fianna Fáil TD Bill Kelleher fighting for the last seat. In this four-seater there is a wide range of possible outcomes. Pat Burton and former Lord Mayor Dara Murphy are running for Fine Gael looking to replace Bernard Allen. Labour’s Kathleen Lynch, Sinn Féin’s Jonathan O’Brien, and Mick Berry from the Socialist Party are also in the running. Fianna Fáil’s Billy Kelleher faces a battle to hold on to his seat with Labour councillor John Gilroy also in contention. Update 1.25am: Heading into the eighth count after which there will be an adjournment until tomorrow. Update 12.45am: Fine Gael’s Simon Coveney says that Fianna Fáil’s Michael McGrath is likely to beat his FG colleague Deirdre Clune to the final seat. Update 12.37am: Green Party’s Dan Boyle eliminated. Update 11.30pm : FG’s Jerry Buttimer has told RTE that there will be a battle for the final seats. Update 10.45pm: Count continues with speculation that we’ll be back there tomorrow for the conclusion. Update 7.45pm: Micheál Martin has been elected on the first count. Update 7.10pm: Micheál Martin has arrived at the count centre. Update 6.35pm: Green Party senator Dan Boyle got under two per cent of the vote and is said to be very, very disappointed and now worries about the party. Micheál Martin will be the first elected followed by either Fine Gael’s Simon Coveney, or Labour’s Ciaran Lynch, Senator Jerry Buttimer also looks set to be elected at the expense of colleague and current TD Deirdre Clune who will battle it out with Fianna Fáil’s Michael McGrath and Sinn Féin’s Chris O’Leary for the last seat. Update 2.30pm: Fianna Fáil leader Micheál Martin will top the poll with his running mate Michael McGrath hoping to join him. Labour’s Ciaran Lynch will be elected. Fine Gael’s Simon Coveney is also looking good. In this five-seater, Fine Gael are looking to get three TDs elected in the constituency of Fianna Fáil leader Micheál Martin who will almost definitely be re-elected. Fine Gael’s Simon Coveney looks certain to be elected and colleagues Deirdre Clune and Jerry Buttimer will be hoping to join him. Labour’s Ciaran Lynch and the independent David McCarthy are also in the running but the Green Party Senator Dan Boyle will be struggling to get a seat. Update 10.30pm: Fine Gael’s Dinny McGinley and Independent Thomas Pringle have been elected with all three seats now filled in the constituency. Update 10.25pm: Mary Coughlan is trending w0rldwide on Twitter. Every cloud…. Update 9.35pm: Tánaiste Mary Coughlan eliminated on the fourth count. Update 8.45pm: Mary Coughlan not conceding yet. Update 5.20pm: Sinn Féin’s Pearse Doherty has been elected after the first count. Dinny McGinley and Thomas Pringle are second and third after the first count with Mary Coughlan in trouble in fourth. Update 2pm: Mary Coughlan looks in trouble with independent candidate Thomas Pringle set to be elected. Labour’s Frank McBrearty has conceded. In this three-seater the Tánaiste Mary Coughlan could be in big trouble. Sinn Féin’s Pearse Doherty looks set to keep the seat he won in a by-election last November. Independent Thomas Pringle will be hoping for a seat with Fine Gael’s Dinny McGinley also in the running. Labour’s Frank McBrearty and the Green’s John Duffy are also in the running but unlikely to be elected. Update 1.27am: Kevin Humphreys has taken the final seat for Labour. Update 12. 54am: Eoghan Murphy has been elected for Fine Gael. Update 10.20pm: Fine Gael’s Lucinda Creighton and Labour’s Ruairi Quinn have both been re-elected. Update 8.40pm: The results of the fourth count are due shortly but it is unlikely anyone will be deemed elected. Update 5.45pm: No candidate has been elected after the first count but Lucinda Creighton was only a few votes off reaching the quota. Second count begins. Update 4.10pm: Dylan Haskins campaign has flopped. He got fewer votes than Facebook friends. Update 2pm: John Gormley looks set to lose his seat with Lucinda Creighton and Ruairi Quinn likely to be elected. Independent Dylan Haskins has reportedly not done as well as expected. In this four-seater two independents could be elected here with Paul Somerville and Dylan Haskins both polling well prior to the election. The Green Party leader John Gormley could be in trouble with Fine Gael’s Lucinda Creighton and former Labour leader Ruairi Quinn expected to hold their seats. This puts Fianna Fáil’s Chris Andrew in trouble along with many other of the party’s TDs in Dublin. Fine Gael’s Eoghan Murphy and Labour’s Kevin Humphreys are also running. Update 6.50pm: Brian Lenihan has been elected on the fifth count without reaching the quota. He admitted that the government had taken a hammering in the polls. Update 4.45pm: Socialist Party candidate Joe Higgins has been elected on the third count in Dublin West. Update 3.55pm: Fine Gael’s Leo Varadkar has been elected in the second count for Dublin West. Updated 3pm: Labour’s Joan Burton has been elected with 9,267 first preference votes. Updated 2.25pm: Joe Higgins has promised “vigorous opposition” to the new government as he looks set to be elected as a Socialist party TD who will be part of the United Left Alliance. Updated 2pm: Labour’s Joan Burton and Fine Gael’s Leo Varadkar will be re-elected and Fianna Fáil’s Brian Lenihan looks set to hold on. Joe Higgins is also looking good for the Socialist party. If every Fianna Fáil TD is in trouble then Finance Minister Brian Lenihan is no different in this four-seater. Fine Gael’s Leo Varadkar and Labour’s finance spokesperson John Burton will be expected to take seats. The Socialist Party’s Joe Higgins will be in the running as will Patrick Nulty for Labour all of which could put Lenihan in trouble. COUNTING FINISHED FOR THE DAY. FULL RECOUNT ORDERED. Update 9.25pm: Labour will now seek a recount in Dún Laoghaire which TheJournal.ie has confirmed with Bacik’s campaign manager. 157 votes in it. Update 9.20pm: Suggestions now that Labour will ask for a recount. There are about a hundred votes between People Before Profit’s Richard Boyd Barrett and Labour’s Ivana Bacik. Boy Barrett tells us that a recount is unlikely to change anything there for Labour. Update 8.57pm: Fine Gael’s Sean Barrett elected on eight count. Update 8.20pm: Barry Andrews eliminated on seventh count. Still no word on whether or not Bacik has conceded. Update 7.45pm: Richard Boyd Barrett tells us Ivana Bacik conceding is ‘just a rumour’, but ‘I’m ahead and hopefully I’ll stay ahead’. Update 7.40pm: Ivana Bacik has apparently CONCEDED that the margin is to big for her to take a second seat for the Labour party. Update 5.40pm: Mary Hanafin says she “wouldn’t be confident of re-election” based on the results so far. Update 4.20pm: Eamon Gilmore elected on the first count. Sean Barrett and Mary Mitchell O’Connor should be elected as well. Richard Boyd Barrett, Ivana Bacik and Mary Hanafin are all battling it out for the final seat. Bacik looks favourite at the minute meaning trouble for Hanafin. Update 2pm: Labour leader Eamon Gilmore look set to top the poll, Sean Barrett should be elected for Fine Gael with Mary Mitchell-O’Connor also polling well for the party. People Before Profit candidate Richard Boyd Barrett is polling well while Fianna Fáil’s Mary Hanafin is in trouble and Barry Andrews appears to have conceded. This four-seater could give an indication of whether or not Fine Gael might be able to form a single party government with Sean Barrett and Mary Mitchell O’Connor, an ex-Progressive Democrat, running for them. Labour leader Eamon Gilmore will be hoping that his running mate Ivana Bacik joins him in the next Dáil. For Fianna Fail, Mary Hanafin and Barry Andrews face a battle for a seat with it unlikely that both of them will be elected. The Green Party’s Ciaran Cuffe will struggle to retain his seat while Richard Boyd Barrett from People Before Profit is the notable independent in the running. COUNTING ADJOURNED IN KERRY SOUTH. Update 11.40pm: Fianna Fáil TD and former Ceann Comhairle John O’Donoghue has been eliminated on the third count. Update 11.22pm: Former Ceann Comhairle John O’Donoghue could be eliminated shortly. Update 10.55pm: Labour’s Marie Moloney has been eliminated on the second count. Update 8.50pm: No candidate has reached the quota on the first count. Fine Gael’s Brendan Griffin looks set to take a seat, currently topping the poll. Update 8.10pm: It’s been pretty quiet from Kerry South but we’ve heard that it’s so close between SKIA Michael Gleeson and Labour’s Marie Maloney that there are discussions about a possible recount or re-check of ballot papers. First count results due shortly. Update 2pm: Independent Tom Fleming is enjoying a notable lead with 20.5 per cent. Michael Gleeson of the South Kerry Independent Alliance is coming in second, while independent candidate Michael Healy-Rae holding third place. A three-seater where the former Ceann Comhairle John O’Donoghue could be in trouble with Fine Gael looking to secure two seats with their candidates Brendan Griffin and Tom Sheahan. Tom Fleming and Michael Healy-Rae, son of Jackie, will be hoping to boost the number of independents in the Dáil with Michael Gleeson from the South Kerry Independent Alliance, who has been polling well, also in the running. Don’t rule out Labour’s Marie Maloney who will hope to take the final seat for Labour. Update 11.57pm: Charlie Flanagan tells RTE FG’s chance of third seat will not be clear until well into Sunday afternoon. Update 10.50pm: Talk now that counting will be suspended at midnight until tomorrow morning. Update 8.30pm: No one elected on the first count in this constituency. Update 6.25pm: Ger Scully from the Tullamore Tribune tells us that the result is expected after 7pm. It looks like Charlie Flanagan and Marcella Corcoran-Kennedy will be elected as Fine Gael TDs. Fianna Fáil’s Barry Cowen and Sean Fleming will also be elected with Sinn Féin’s Brian Stanley the favourite so far for the last seat. Update 2pm: With all ballot boxes open in the constituency Fine Gael’s Charlie Flanagan tops the poll and looks set to be joined by running Marcella Corcoran-Kennedy. Brian Cowen’s brother, Barry, will also be elected with one other Fianna Fail TD set to join him. In this five-seater Barry Cowen looks set to replace his brother and Taoiseach Brian Cowen who is stepping down from the Fianna Fáil seat but neither of the party’s other candidates TDs John Moloney and Sean Fleming look set to join him. Fine Gael have four candidates running - Charlie Flanagan, John Moran, Marcella Corcoran-Kennedy and Liam Quinn – of which they hope three can be elected. Labour are running former journalist John Whelan with Sinn Féin’s Brian Stanley is also running alongside other notable candidates including Ireland’s first black mayor Rotimi Adebari. Update 11.35pm: Labour’s Jan O’Sullivan takes the final seat on the seventh count. Update 10.45pm: Fianna Fáil’s Willie O’Dea has been elected on the sixth count. One seat left to be filled. Update 9.55pm: Kieran O’Donnell has been elected in Limerick for Fine Gael. Fianna Fáil’s Peter Power has been eliminated. Update 5.10pm: Michael Noonan has been elected with over 30 per cent of the vote on the first count. Fianna Fáil’s Willie O’Dea and Labour’s Jan O’Sullivan are in second and third. Kieran O’Donnell is in fourth as the second count begins. Update 2pm: Michael Noonan looks set to top the poll and his running mate Kieran O’Donnell should join him. Fianna Fáil’s Willie O’Dea will hold on and Labour’s Jan O’Sullivan should also take a seat. In this four seat constituency Fine Gael’s spokesperson Michael Noonan will be hoping that his running mate Kieran O’Donnell will be joining him. Fianna Fáil’s Willie O’Dea will be hoping to hold his seat and Labour’s Jan O’Sullivan will also be hoping to hold on. Update 1.20am: Fianna Fáil’s Peter Kelly has lost his seat on the fifth count. Update 12.30am: Counting continuing and may finish tonight. Update 11pm: Labour’s Mae Sexton has been eliminated. Our man in the count centre, Paul Hughes, says Fianna Fáil’s Robert Troy is now the favourite for the last seat. Update 10.05pm: Fine Gael’s James Bannon and Nicky McFadden are likely to take the next two seats here. The party will hope for a third seat for Peter Burke but Fianna Fáil’s Robert Troy is also in the running and could benefit from O’Rourke’s transfers, according to Paul Hughes from the Westmeath Examiner. Update 9.45pm: Willie Penrose elected on second count. Mary O’Rourke eliminated. Update 8.15pm: No one elected on first count here. Labour’s Willie Penrose is 100 votes off the first quota. Update 7.15pm: Mary O’Rourke says she will now retire to write a book and spend time with her grandchildren, according to Paul Hughes from the Westmeath Examiner. Update 6.25pm: Mary O’Rourke has admitted that she will be eliminated from the contest. Update 3.30pm: The final ballot tallies indicate that O’Rourke is definitely headed for defeat with Fine Gael on course for three seats. Updated 2.30pm: There are reports that three Fine Gael candidates will be elected along with one Labour which means Mary O’Rourke will lose her seat having polled less than 3,000 first preference votes. In this four-seater Labour’s Willie Penrose and Fine Gael’s James Bannon are expected to take seats with Fianna Fáil’s Mary O’Rourke battling to hold on to her seat. Her party colleagues Peter Kelly and Robert Troy are also in the running. Kevin ‘Boxer’ Moran, and ex-Fianna Fail member and now independent, is expected to take some of O’Rourke’s vote. Fine Gael will be hoping to take a second seat from either Senator Nicky McFadden or Mullingar councillor Peter Burke. Mae Sexton, an ex-Progressive Democrat, is running for Labour. Siobhan Kinihan is running for the Green Party. Sinn Fein candidate Phil Hogan is also standing. Update 10pm: No one elected on third count here. Update 8pm: Enda Kenny and Michael Ring both elected on the first count. Update 7.10pm: The results of the first count have been delayed for another hour according to the Western People newspaper. But it appears Enda Kenny has left for Dublin on a helicopter. Update 5.15pm: Enda Kenny has arrived at the count centre to a rapturous reception. First count results expected soon. Update 3.45pm: With all boxes now open in Mayo the tallies indicate that Fine Gael will indeed take four seats with Fianna Fáil’s Dara Calleary holding on for the final seat. Updated 2pm: Fine Gael look certain to take the four seats it was targeting in leader Enda Kenny’s constituency with nearly 65 per cent share of the vote. Fianna Fáil’s Dara Calleary looks set to hang on and take the fifth seat. In the five-seater constituency of Fine Gael leader Enda Kenny’s the election of four of the party’s candidates would be an indication of it being a very good day for them. As well as Kenny, who will be expected to top the poll, Michelle Mulherin , Michael Ring and John O’Mahoney will be hoping to join their leader in the next Dáil. Jerry Cowley is running for Labour with Fianna Fáil’s Dara Calleary looking to be in trouble. Sinn Féin’s Thérése Ruane and the Green Party’s John Carey are also running. Update 12.15am: Fine Gael’s Paul Kehoe and Liam Twomey have also been elected completing the seat with Labour’s Brendan Howlin elected earlier. Update 12.08am: John Browne, Fianna Fáil, has been elected. Update 11.10pm: Fianna Fáil TD Sean Connick has lost his seat having been eliminated on the sixth count. Update 5.10pm: Mick Wallace has been elected with over 13,000 votes. The second count begins with Brendan Howlin second, followed by the three Fine Gael candidates for the five seat constituency. Update 3.30pm: Prospective TD Mick Wallace said he will seek to form a technical group in the next Dáil. Updated 2pm: Independent Mick Wallace looks almost certain to top the poll. Fianna Fáil’s John Browne should be elected but colleague Sean Connick is in trouble. This five seater constituency is notable for the candidacy of builder and political activist Mick Wallace, as an independent, who has been polling very well. It is also notable for the presence of a De Valera with Eamon’s grandson Ruairí running as an independent despite his obvious connections to Fianna Fáil whose own Sean Connick and John Browne could both be in trouble. Labour’s Brendan Howlin will be hoping to hold his seat and bring in his running mate Pat Cody. Fine Gael’s Michael D’Arcy and Paul Kehoe will be hoping to be re-elected with colleague Senator Liam Twomey also running. Email “The Hot List: How the day unfolded in 12 key constituencies ”. Feedback on “The Hot List: How the day unfolded in 12 key constituencies ”.